(April 9, 2019) OEA Pres. Becky Higgins (center) provides proponent testimony on behalf of HB 154 to the Ohio House Education Committee. Standing in solidarity are Jay Pickering (left) of the Lorain EA and Larry Ellis (right) of the Youngstown EA. Good evening Chair Blessing, Ranking Member Robinson and members of the House Education Committee. On behalf of our 122,000 members, I am Becky Higgins, President of the Ohio Education Association. I am here today to ask for your support for House Bill 154. Also with me is Larry Ellis, the local president of the Youngstown Education Association and Jay Pickering, the local president of Lorain Education Association. Matt Dotson with OEA Government Relations is also here and can assist with any questions you may have. 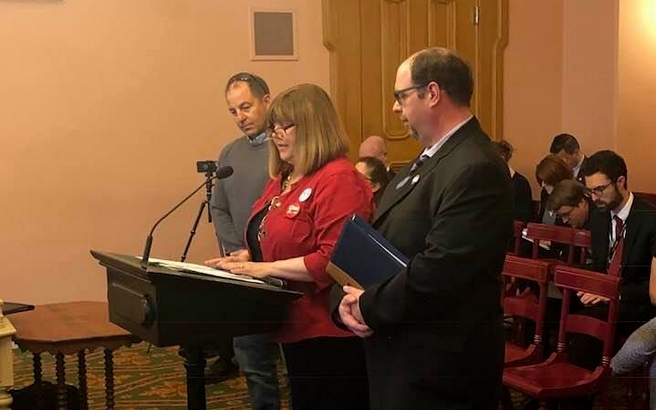 As you might imagine, the fact that two former teachers are the bi-partisan joint sponsors of House Bill 154 is a big part of why we are strongly supportive of this bill. These gentlemen, Representatives Jones and Miller, know first-hand what is needed to meet the challenges of providing a quality education in troubled school districts. And the current state takeover law is not getting the job done. If current law is not changed, over the next two years state government could take away local control from Dayton, Columbus, Canton, Mansfield, Lima, Toledo, Ashtabula, Euclid, North College Hill and Painesville schools. It’s time for this to end. Let’s not do any more damage to other school districts. Repeal the ill-conceived law that allows the state to takeover local school districts that are deemed to be in trouble. Restore local control to elected school boards. Hold school districts accountable by requiring school improvement teams in F-rated school buildings. Pictured: Julie Garcia, Lorain EA, also a proponent of HB 154, shares the realities of how HB 70 has been a total failure in Lorain. As my colleagues and our fellow OEA members in Youngstown and Lorain have experienced, the current state takeover law provides no citizen oversight through elected school boards, no voice for classroom teachers and has been bad for our kids. Our experience in Youngstown and Lorain has demonstrated that the Academic Distress Commission/CEO model does not work. We believe that no more districts should be taken over, and that the districts that have been taken over should be relieved of that burden. That is why the first part of House Bill 154 is so important – repeal. It is also important to note that state takeovers are based on misleading state report cards that severely penalize students and districts in poverty. 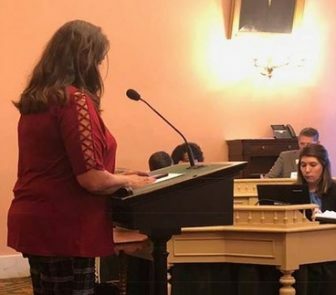 After the failed state takeover law is repealed and local control is restored, OEA stands ready to partner with the House Education Committee to fix Ohio’s broken and deceptive report card system. Thank you for this opportunity to testify in support of House Bill 154. We are available for any questions you may have.